This week I made a record of signage which I encountered that was confusing, misleading, badly designed, or all of the above. I found several examples but the ones below are worth further analysis. 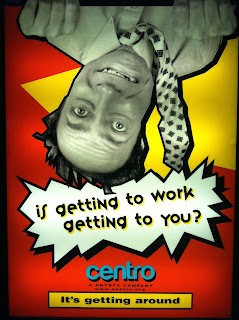 I found this advertisement a few years ago in a bus station in upstate New York. The tagline "Is getting to work getting to you?" isn't that bad but the design is over-the-top wacky. It's clear that the company, Centro, is probably involved in the transportation industry, but there is no additional information and the ad is highly forgettable. The awning of Park Slope restaurant Istanbul Park Turkish and Mediterranean Cuisine has a potentially great design that is poorly executed. The spire atop the dome in the picture to the left of the name represents the letter "I" but to passerby it simply reads "Stanbul". The ultra-decorative typeface only serves to distance this text from the "I". Additionally, the full name is "Istanbul Park" but "Park" is in green and obscured by a tree. This sign, which I found in Cold Spring, New York, features instructions for crossing the street. However, it seems vastly more complicated than it needs to be. The typefaces, iconography, and layout do very little to guide the reader to any logical conclusion. 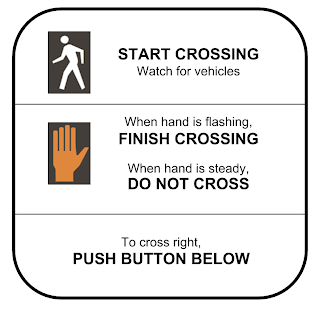 Because most of us are too familiar with crossing the street to require literal directions, it is easy to overlook this confusing sign. That's why I chose to redesign it. I started by standardizing the typeface (using Arial). Then I eliminated the confusing iconography and verbiage in favor of non-repetitive icons and simple phrases like "When hand is flashing...". I also included plenty of negative space to reduce the cluttered feeling, and I removed the section about the timer because I felt like a countdown timer is a fairly intuitive thing, given the context. My design could certainly be improved but I think it's already much better than before. If I continued this redesign I would take a longer look at the bottom section. 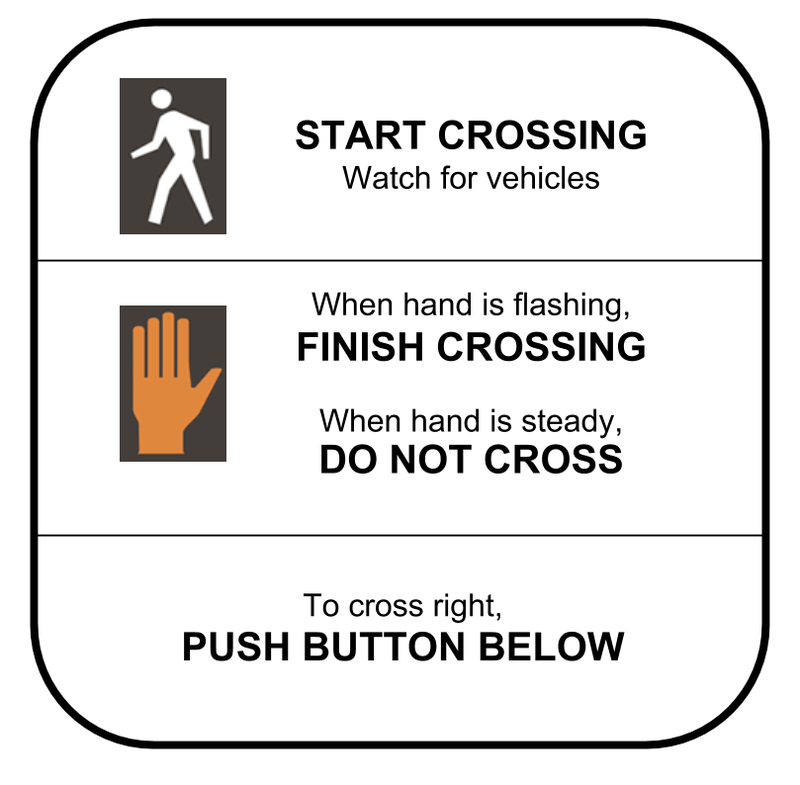 There are eight signs per intersection (two pointing to each crosswalk) and perhaps the arrow is more clear that simply "to cross right". The sign above is one that I like. It is a traffic sign in a residential/park neighborhood in Melbourne, Australia, warning drivers to watch for aged people crossing the street. My parents got a kick out of having their picture taken below it, and it has a special place in family stories about our trip there. 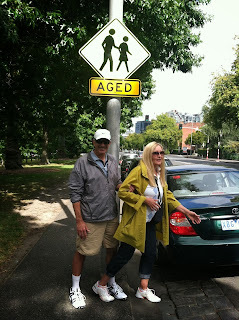 It is an ordinary sign, even ugly, but it has sort of transcended its intended role.